57.1 "a sense of proportion"
> 57.1 "a sense of proportion"
I was listening to the Scott Mandelker Law of One series (where he goes through all 106 sessions, in sequence), and come across this little gem of a definition, that hadn't registered with me before. Despite the Ra Material being dear to my heart for over ten years, and having subjected it to considerable analysis, there are still sentences (and phrases) that I'm consciously recognising for the first time. Like things I've scanned over (and read), but it's like - 'how come I didn't see this before!". "This instrument is bearing up well due to replenished vital energies and a distortion towards a sense of proportion which your peoples call a sense of humor." how key is that in the Earth Journey, when things can seem so dire and beyond repair? the 'light touch' if you will. Humor is not necessarily about making fun of things, or a sense of mockery. 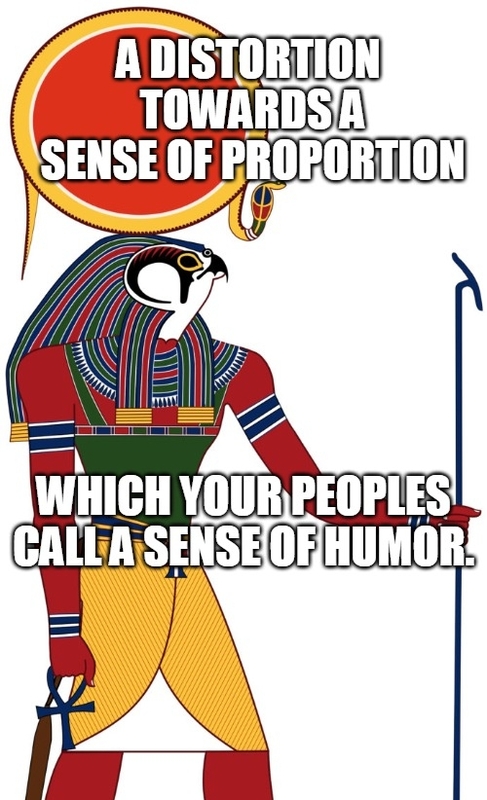 Humor - when done right - puts things into perspective - and helps us to laugh at our previous sense of over-seriousness. The good comedians can shed so much light on the pain and suffering that we go through together in this life. It's not about 'joke jokes' - it's about balance and understanding. This Ra observation really crystallised this! RE: 57.1 "a sense of proportion"
Bigger egoes would fine humor problematic. this afternoon something related happened to me. At first I got angry then when it happened a second time I couldn't help but laugh. which was unexpected and turned the whole thing around. Something that's usually handled negatively was handled with love I think. Certainly. Someone who is ENTIRELY CONVINCED of their perspective (and can't appreciate alternate perspectives on the same issue) is someone who can't learn (and hence - can't grow). That said - there are definitely some traumas (and pain) which people aren't yet ready to get close to. And so the attitude is very GRAVE and SERIOUS. It's heavy - and the energy gets dragged into some kind of vortex.